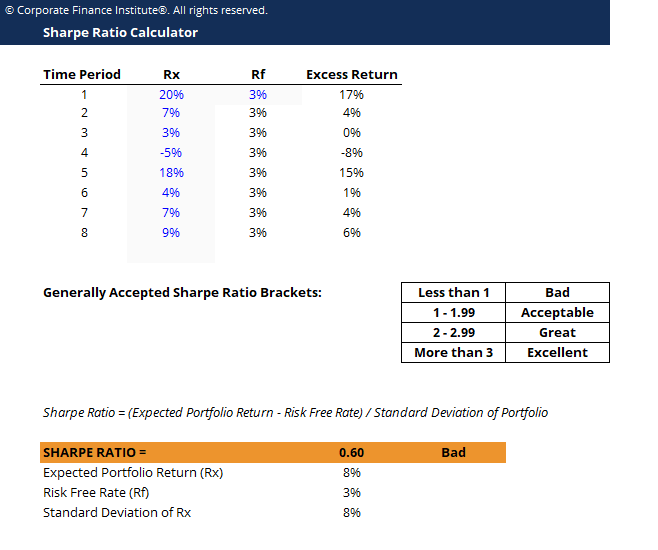 This sharpe ratio calculator template demonstrates the calculation of sharpe ratio to determine an investment’s performance relative to risk. The Sharpe ratio is commonly used as a means of calculating the performance of an investment after adjusting for its risk. This allows investments of different risk profiles to be compared against each other. In the Sharpe Ratio, a higher value means greater returns for the portfolio relative to the inherent risk. This also means a better investment. Because of the simplicity of the formula, the Sharpe Ratio can be used to evaluated a single stock, or an entirely diversified portfolio.